Leanne and I enjoy coffee every morning, but a Mr. Coffee doesn't fit with our lifestyle. While we have invested some space in a burr grinder, a standard household coffee maker requires too much space and electricity to justify. The ideal coffee maker for an off-grid small space is compact, lightweight, requires no electricity, creates minimal waste, and makes fantastic coffee. Some of the links in this article are affiliate links. Help support Tiny Life Gear by purchasing products you need through the links from this page. If you buy something based on our recommendation, we might earn a small commission for referring you. The simplest solution is a pour-over. Pour-overs are available in plastic, metal, ceramic, or glass. A simple cone fits over your coffee mug and holds a cone coffee filter. The principle is the same as a Mr. Coffee style appliance, but instead of heating the water inside the appliance, you just pour hot water over the ground coffee, and it drips into your mug. Pour-overs generally work best for one cup at a time. The beautiful Chemex coffee maker is a variation on the pour-over theme that works great for brewing multiple cups. Since pour-overs use coffee filters, they do generate some waste, but you can always compost it. There's a special kettle design that's ideal for pour-overs, but it's not strictly necessary. I prefer a wide bottom kettle for general use since it gives the water more contact with the heating surface, which means my water heats faster. Coffee snobs everywhere (I know, pot...kettle...) swear by the Aeropress for making a superior cup of coffee. The brewing process is similar to a french press in that beans are mixed with water in a brewing chamber and then plunged to separate the coffee and the grounds. 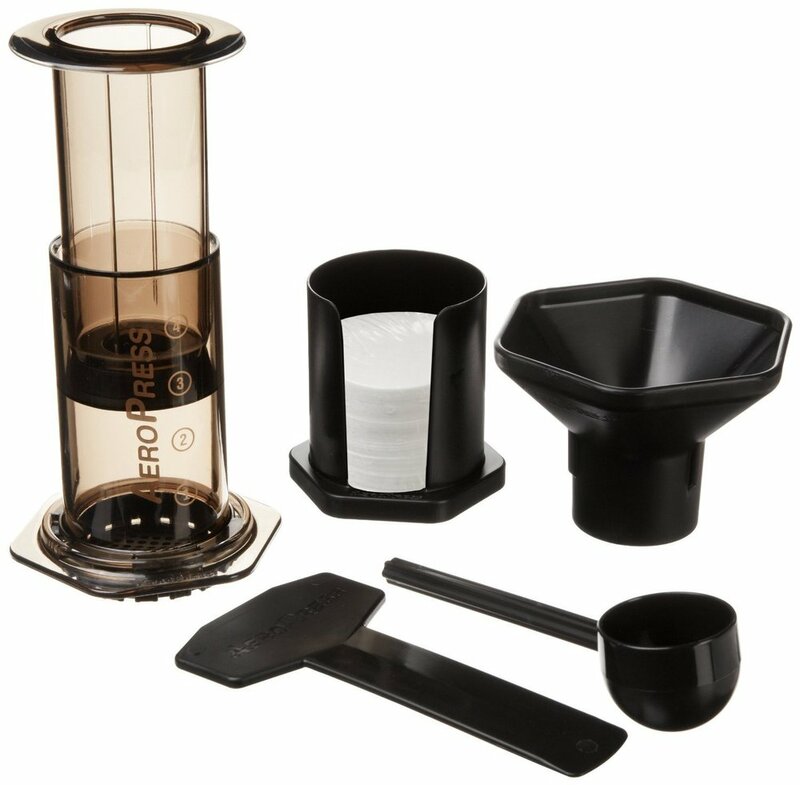 But instead of a mesh screen, the Aeropress uses a small paper filter. Reusable mesh filters are available, but it's generally accepted that paper filters make a superior cup of coffee, and they're probably worth the waste. Side-note: I don't understand the point of a vacuum insulated french press. If you leave your coffee in the press after it's done brewing, even after the plunger is down, you're going to over-extract it, and it's going to taste awful. If you're using a french press, preheat it before you put your coffee in, and get your coffee out of the press as soon as the plunger is down. My preferred coffee making hardware is a stovetop coffee maker called a moka pot. We use a Bialetti 6-cup model that makes two small mugs of strong coffee at a time. Often advertised as an "espresso maker," the Bialetti doesn't make espresso exactly, but instead makes a kind of coffee called moka. For actual espresso off-grid, you'd want a manual espresso press. The moka pot has three pieces -- a lower chamber for adding your water, a middle chamber for adding your ground coffee, and a top chamber for receiving the finished product. When you heat the lower chamber, as the water nears the boiling point, steam builds up and forces the water upward through the middle chamber containing the beans, and into the top chamber. Since the top chamber isn't anywhere near the heat, it's virtually impossible to burn your coffee like you could with a percolator. Regardless of your brew method, one of the best things you can do to get the most out of your beans is to grind your coffee immediately before brewing. Lots of the flavor compounds in coffee are volatile—meaning they evaporate at room temperature—so your coffee quality starts to deteriorate minutes after it's ground. The best way to grind is with a burr grinder. Unlike a blade grinder that can produce all sorts of sizes and jagged shapes of coffee grounds, a burr grinder produces uniform grinds in a size that you can specify, so you get just the right amount of extraction for your brewing method and taste. We use a Capresso electric model powered by our inverter. 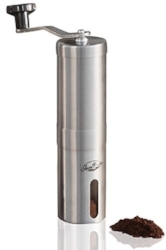 For those looking for a non-electric solution, a manual burr grinder is the way to go. If you're a heavy coffee drinker, or just especially serious about getting the best possible cup of coffee, you might give roasting your own beans a try. Unroasted green coffee beans can be purchased in bulk for very reasonable prices, and unlike roasted coffee that can deteriorate within a month or two, properly stored green beans keep for years. Beginners can give roasting a try using tools they already have on hand. A steamer basket in a 500 degree oven works great. A saute pan on the stove top also works, but it's a bit of a workout. An air popcorn popper is a fantastic roasting tool, though I don't suggest keeping one of those on hand unless popcorn is a major staple of your diet. We keep a Whirley Pop for popcorn (watch your local thrift store if you want to get one for cheap), which should work just as well for coffee as long as you shake it continuously to keep the beans from burning. Purpose built handheld coffee roasters in ceramic or aluminum are fairly compact and lightweight, and for a heavy coffee drinker, will pay for themselves in no time.